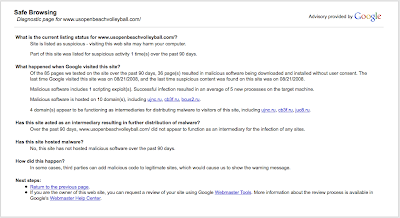 While doing some research, I found that Google identifies Karch Kiraly's US Open of Beach Volleyball Web site as a security risk (see screenshot below). Basically, the site was hacked and may be installing nasty programs on visitors' computers. I gave it a cursory inspection but couldn't find any obvious exploits, so the problem may already be fixed. Damn. Volleyball peeps need to get their online sh*t together (or hire me to do it for you). The US Open of Beach Volleyball was created by Karch Kiraly and his agent, Steve Lindecke, and USA Volleyball. Lindecke's company, The Elevation Group, produces the event.